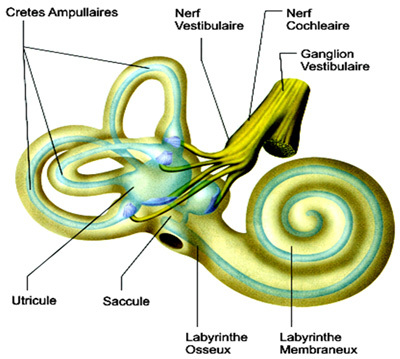 The peripheral vestibular system is included of five different types of sensors in each ear: three semi-circular canals (horizontal, and anterior and posterior vertical canals) and two otolithic organs (the utricle and the saccule), i.e. a total of ten receptors. The semicircular canals detect the amplitude of the angular rotation of the head in the three dimensions of space. The otolithic organs are sensitive to vertical linear acceleration (the saccule) or horizontal linear acceleration (the utricle) of the head in space, and they detect tilting of the head relative to gravity. 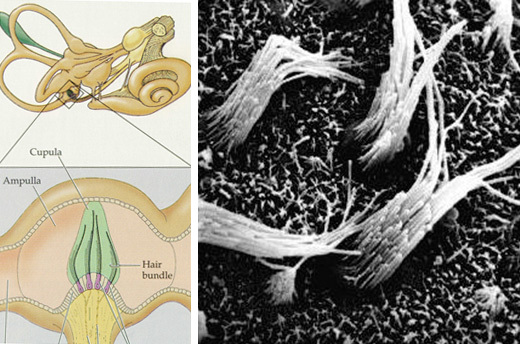 Sensory cells are hair cells whose cilia bathe in the endolymph. Otolithic sensory cells have the characteristic of being covered by a tectorial membrane embedded with small crystals of calcium carbonate or otoconia. 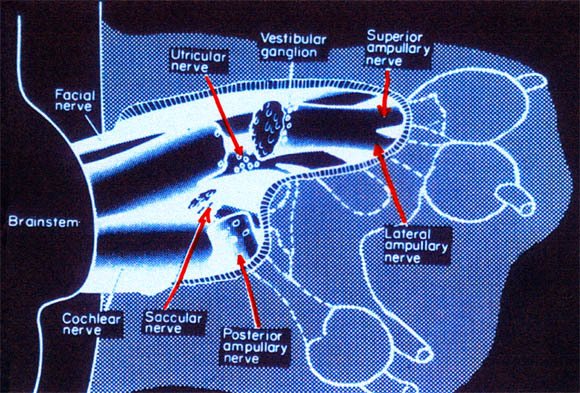 • the superior vestibular nerve comprising the nerves of the horizontal and anterior canals and utricular nerve. • the inferior vestibular nerve comprising the saccular nerve and posterior canal nerve. The two branches of the vestibular nerve are distributed to the vestibular nuclei, located in the brain stem either side of the fourth ventricle. The central vestibular neurons are then distributed to the oculomotor nuclei to steady the gaze or to the spine to stabilize posture. 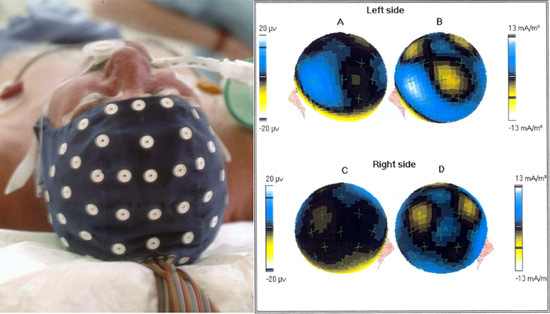 In addition to vestibular inputs, these nuclei receive visual and proprioceptive inputs. 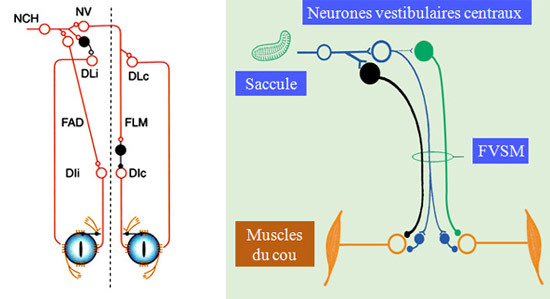 Vestibular nuclei are therefore not merely there to relay information from the inner ear, but are veritable sensory motor integration centres. The central vestibular neurons are then distributed to the oculomotor nuclei to steady the gaze or to the spine to stabilize posture. 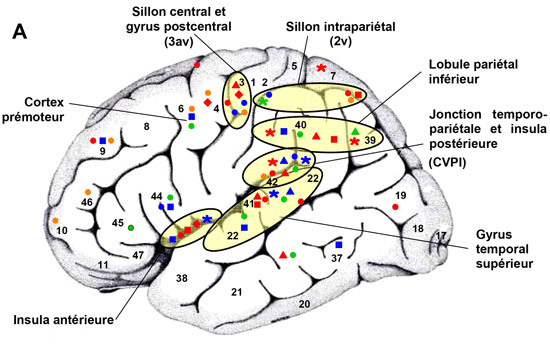 The vestibular nuclei are also distributed to the cortex, which plays a part in the perception of movement.